John Takes Pop-Culture: What Is There to Talk About? The Paragon of Animals is pouring this coffee. In “The Good, the True, and The Beautiful”, I mentioned that the line between artist and audience isn’t that dark when they both strive towards the titular ideals. That’s a nice sounding, vague sort of thing to say, but it bears a lot more thought. If pop-culture is a big conversation about goodness, truth, and beauty (or, at least, if it is forced to be by me) what is there really to say? How do we talk about those things by filming movies and watching them, coding games and playing them, writing music and listening to it? There are a few notions I’m sure you’ve heard concerning what “art” is for. One would be “self-expression”; another would be to “make a statement”. Either of these might be important things to do with “art” under certain circumstances, but they are not the primary thing, not the essential thing, that artistic works bring to the table. One can express one’s self in other ways (whether he can express himself through art at all is a question worth asking) and although very sophisticated art may be required to make certain statements, this is due to the magnitude or subtlety of the statement and not to the fact of it being a statement at all. What artistic works like movies, paintings, and music do bring to the table are depictions of characters, events, forms, etc. that are particular. But, because no particular thing exists without universal qualities, in their particularity they express universal things. Seeing the particular we can look to the universal, and through the universal to the ideal. 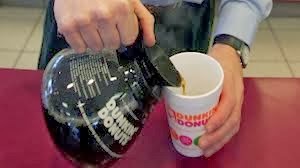 Just as we may, for example, with the guy that works at Dunkin’ Donuts. This, of course, is very unlikely to happen if you don’t actively think about it. One might very well pass through his life without ever looking at the universal things and principles embodied in the particular people, things, and events he comes across in actual life. In this regard artistic works are no different. If we think about them we can look behind what is depicted in them to universal things beyond and, hopefully, to the truth and beauty beyond that. The difference between a trip to Dunkin’ Donuts and watching Firefly is that the guy behind the counter at Dunkin’ Donuts is really a guy, and Malcolm Reynolds is not. This makes it important, if we are going to get at goodness, truth, and beauty by means of art, that it be a conversation among equals looking for the same things, and not the privileged few feeding the rest of us what they cook up. When a guy on the street does something to me (says hello; steals my wallet; gives it back; whatever) the particular things that happen tell me of universals simply by happening, because they are real. When an artist presents something to an audience, he’s a fallible man attempting to depict particular things. He’s saying something in the big conversation, but he might not be right, or might not know what he’s saying. The people listening need to scrutinize what he’s said, explore it, and compare it to what they know so that we can benefit from it.